Our Fab Fash Life: Our Baltimore Inner Harbor Shoot!!! Piper did her first shoot with me this week, and I have to say my little cutie is a natural. She did so well despite the fact that it was her first time around so many people. She has a star quality that just attracts people to us, every other person asks how old she is, how much she weighs, how much she will weight, and what kind of a dog she is. Then comes what is her name and does she bite...lol!! She's so darn tiny and cute that people just can't help themselves, and I have to say if the shoe was on the other foot and she were someone else's dog, I would probably do the same. Everyone assumes she is a chihuahua, I guess because of her size because see she looks nothing like a Chi. Either way I'm so happy about my decision to get Piper after loosing Nunah, only because I was so super sad. I felt like I had this huge hole that nothing could fill, and it was so weird without her. Piper definitely doesn't replace Nunah nothing ever will, but she sure helps a heck of a lot. Piper brings joy back into my home and life, I thank goodness for her every day. We went to the Baltimore Inner Harbor for the pictures, it's a beautiful and quite busy spot. Now note the most walking on a leash that Piper had done up to this point was for a minute or two on our street, so I was very proud of her when she walked so good for a couple hours. Just like a baby, she's so curious and gets into everything, it's so funny and adorable. When we placed her on the Merry-Go-Round she was all over back and forth, she just can't be still for a second, so I can't wait until she get's the hang of posing like Nunah did. We are taking Piper in on the 8th to have her ears cropped and get her microchip, she's gonna look even cuter with cropped ears. I just hate the fact that she will have to wear the cone of shame for 2 weeks, something tells me she's gonna hate it even more because she hates anything on her. It's a fight just to get her little harness on, not to mention how she chews the heck out of the tag on her collar. I cant imagine that silly thing around her neck. Thank goodness I found one of the best in my area, she's been cropping for over 40yrs. That makes me feel a little better, but I'm still going to worry like heck. Regardless of her craziness and inability to concentrate she did remarkably well, as did the quite amazing gal who shot our pics. You definitely have to look for these pictures on my Instagram page to get her info, she's running a giveaway for a free photo session. She's super sweet and helpful, not to mention great with a camera. In the image I'm wearing a fantastic top from White House Black Market, I got it for under $60 during the Black Friday Sales. I wore it with a cute pair of American Eagle Outfitters destroyed denim jeggings, and a pair of black Guess riding boots. Then I finished it off with my white Kate Spade Saddle Bag, nothing crazy just the cute comfy style I love so much. If you look closely at the image you'l see the oh-so-cute ear muffs I got for $20 from Kate Spade on Black Friday as well. Kate Spade is one of my all time favorite spots to shop, especially when there's a HUGE sale...lol! I can't wait for weather cold enough to wear them...lol! The inner ear part is nice and furry, and the ouster side and edges are super soft due to the sweater material they're made out of. I think they'll go perfectly with my black trench, I also have a great black card sweater that looks like it was made for these. I love it when I buy stuff and find that when I get home it coincidentally matches some other thins in my closet. It doesn't happen all the time, but you know what I mean about that awesome feeling of accomplishment you get when it does...lol! Plus look at the cute little kitty face details, it doesn't get any better than that. All in all the it was a really good day, Piper and I made a cool and talented new friend. I can't wait to hear what you guys think of the pictures, also keep and eye out, I have some great new posts and giveaways coming up here and on Instagram. Speaking of giveaways I have a great one for you guys NOW!! Omg you two are absolutely adorable Dana! Love this! Thanks so much, we had a fun day dong the shoot. Thank you!! Piper is always so photogenic...I'm so jealous..lol! I love your ear muffs, so so cute!!! And your new pup is just the cutest!!!! You look so happy!!! Loving the pics! Adorable! Good luck all! I just can;t wait to wear them because they're so soft!! This shoot turned out so cute! You always have the best giveaways! Love your photos ! You should definitely enter...it's a killer prize, especially with Christmas coming! These photos are great! Piper is so precious! I have a Husky and I love taking photos of him and with him. Dogs are just the best! Lovely & Beautiful pic of you and Piper and love the photos. Really nice photos and what a cute little dog you have. Awe! So adorable. I need to do a photoshoot with our dogs. Pets are the best! So cute! I love the black earmuffs. She is so cute . I love the name . Photos turned out incredible . I can never seem to get a good one of my dog unless she’s sleeping . Piper looks like a pro posing on the merry-go-round! She's adorable! I love your outfit, especially those kitty ear muffs! 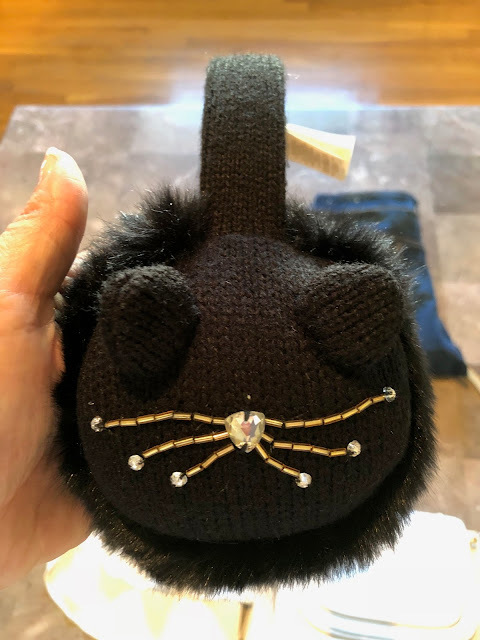 Those ear muffs are fabulous! That is the cutest dog ever. I want one! Thanks for posting! Does Piper like the 🏖 ? Love the ear muffs. Piper is so incredibly cute! I just can't get over how tiny your dog is! He's 1/4 the size of my cat! Piper is so tiny! Love those earmuffs!